' My favorite festival, Diwali', Oh! I have lots to do! I hear the cheerful children talking about crackers and lights! Some of them hate noisy crackers and the smelly fumes! And many more are looking forward, dreaming of all the fun they could have once their cousins arrive! There is always the happiness and cheer the festival brings to our homes! Please find Diwali themed printable coloring sheets, if your children enjoy coloring! It is interesting to know that 'Rangoli' is a Sanskrit word which means a creative expression of art through the use of color.The word rangoli may also have come from "rang" (color) + "aavalli" (row), which means row of colors, or from rang+avalli, which means lines or patterns of colors. Basically, Rangoli is the art of drawing images and motifs on the floor, using different color powders or washable paints - poster paints preferably . Designed with a beautiful combination of various colors, the Rangoli images create an enchanting piece of art and bring in a festive look when decorated with diyas. 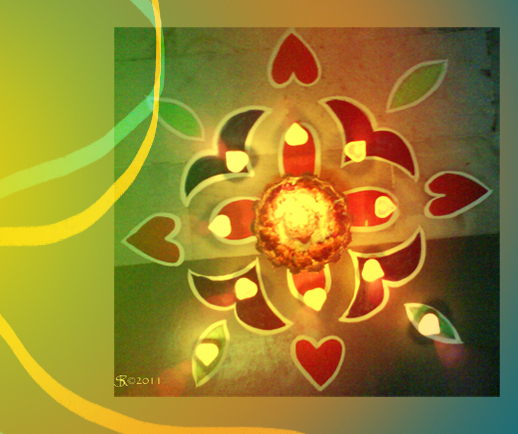 You can find a whole lot of Rangoli patterns on the net or simply create your own designs! Dear Surekha, what a wonderful site you've got here! I'm so honoured to be on your list, Thank you so much, my friend! Thank you so much, dear Anneke! It is a great honor and pleasure for me! I have seen most of content of regarding designs and art on your site, which are beautiful thanks for posting this blog.... and god bless you dear. Dear Nita, Thank you so much for your visit and your kind comments. Much appreciated.